As we all know, technology is advancing rapidly. 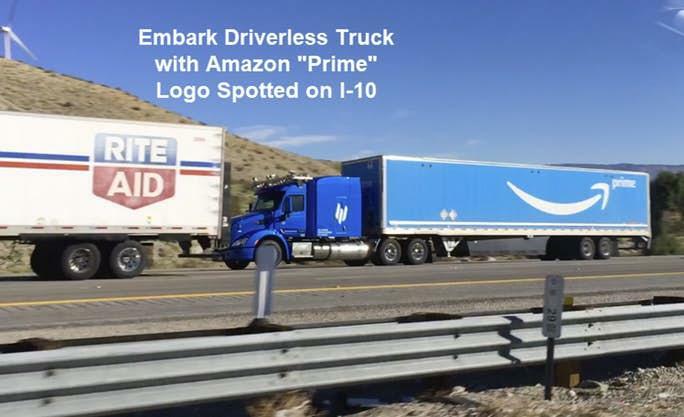 A self-driving truck made by Embark was recently spotted on the I-10 with the Amazon logo. Is Amazon making driverless trucks? To simply answer the question, no they are not making self-driving trucks. 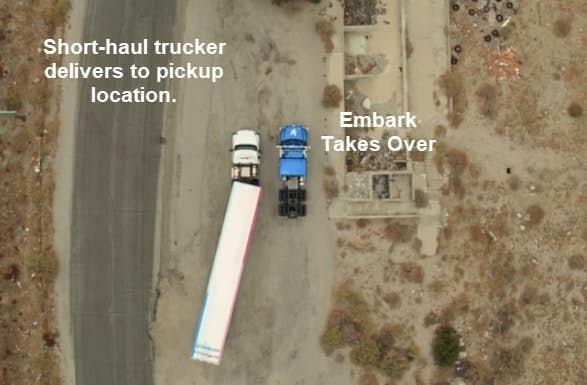 However, they are using self-driving trucks made by Embark. Although neither company would comment on it CNBC discussed the event in Amazon is hauling Cargo in self-driving trucks developed by Embark. For those of you who are not aware Embark is a freight company hauling autonomously from Texas to California. “This is the first time someone has demonstrated this end-to-end," Embark CEO Alex Rodrigues says. "Embark moves freight for a number of major companies on the I-10, however, we cannot discuss any company specifically as our relationships are confidential." Embark CEO Alex Rodrigues says. A driver shortage currently plagues the trucking industry. A lack of available drivers and trucks poses a challenge to e-commerce companies. Including Amazon, whose customers expect deliveries in a relatively short time. qjklnpdxo Yeezy Shoes,If you are going for best contents like I do, just go to see this web page daily because it offers quality contents, thanks! I wish to express thanks to you just for rescuing me from this incident. As a result of looking through the world wide web and coming across recommendations which were not helpful, I figured my life was over. Existing devoid of the strategies to the problems you have fixed by way of your report is a crucial case, as well as those which could have in a wrong way affected my entire career if I had not noticed your site. Your own personal natural talent and kindness in maneuvering all areas was very helpful. I’m not sure what I would’ve done if I hadn’t discovered such a point like this. I can also at this point relish my future. Thanks for your time so much for the high quality and effective guide. I won’t hesitate to endorse your blog post to anybody who would need recommendations about this matter. I do enjoy the manner in which you have framed this situation plus it does indeed provide me some fodder for thought. Nevertheless, through everything that I have seen, I simply hope when the reviews pack on that individuals stay on issue and in no way embark on a tirade associated with the news du jour. All the same, thank you for this outstanding piece and though I do not really agree with it in totality, I value the point of view. Great goods from you, man. I have understand your stuff previous to and you’re just extremely great. I actually like what you have acquired here, certainly like what you’re saying and the way in which you say it. You make it entertaining and you still care for to keep it smart. I cant wait to read far more from you. This is actually a terrific site. Excellent items from you, man. I have take note your stuff previous to and you are just extremely excellent. I really like what you have bought here, certainly like what you are stating and the way wherein you are saying it. You make it enjoyable and you continue to take care of to keep it smart. I can not wait to read far more from you. That is actually a wonderful website. djgyovp Yeezy Boost 350,A very good informative article. I’ve bookmarked your website and will be checking back in future! vzkcqnpqkx,A fascinating discussion is definitely worth comment. I do think that you ought to publish more on this topic, it may not be a taboo exhcxauqft,subject but generally folks don’t talk about such subjects. To the next! All the best!! dzfgbut,A very good informative article. I’ve bookmarked your website and will be checking back in future! xeshulry,Quality blog, keep up the good work. You may check our website also! kfpsumb,Thanks for sharing such an amazing blog. I am so happy found this informative blog. Wow, fantastic blog format! How lengthy have you been running a blog for? you make running a blog glance easy. The total glance of your web site is magnificent, let alone the content material! vjenwsj,Thanks for sharing such an amazing blog. I am so happy found this informative blog. ortpcmnzjz,If you are going for best contents like I do, just go to see this web page daily because it offers quality contents, thanks! You actually make it appear really easy along with your presentation however I to find this matter to be actually one thing that I feel I might never understand. It seems too complex and very extensive for me. I’m looking forward for your next submit, I’ll try to get the hang of it! xdxtqnf,Thanks a lot for providing us with this recipe of Cranberry Brisket. I’ve been wanting to make this for a long time but I couldn’t find the right recipe. Thanks to your help here, I can now make this dish easily. My partner and I stumbled over here different page and thought I may as well check things out. I like what I see so now i’m following you. Look forward to looking over your web page repeatedly. ppvgxq,Some really nice stuff on this website, I enjoy it. Its such as you read my mind! You appear to understand a lot approximately this, like you wrote the book in it or something. I think that you simply could do with some percent to drive the message house a bit, however instead of that, that is wonderful blog. A great read. I’ll definitely be back. I have been exploring for a little bit for any high-quality articles or blog posts on this sort of area . Exploring in Yahoo I at last stumbled upon this site. Reading this information So i’m happy to convey that I have a very good uncanny feeling I discovered exactly what I needed. I most certainly will make sure to don’t forget this website and give it a look on a constant basis. I’m also writing to let you be aware of of the outstanding encounter my child obtained reading your web site. She came to find a lot of things, with the inclusion of how it is like to possess an excellent helping style to get many others very easily fully grasp some complicated things. You really exceeded people’s expected results. Thank you for rendering those essential, dependable, informative as well as unique tips on that topic to Tanya. It’s a pity you don’t have a donate button! I’d definitely donate to this excellent blog! I suppose for now i’ll settle for book-marking and adding your RSS feed to my Google account. I look forward to fresh updates and will talk about this site with my Facebook group. Chat soon!